Rooftop botany goes to ground - my plant nursery: Tulips from Amster ... Damn! 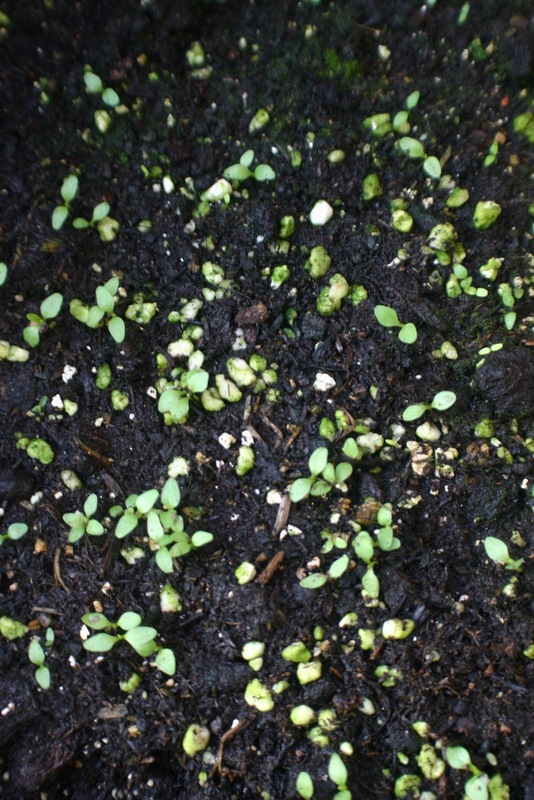 STOP PRESS...STOP PRESS... My Rhododendron griersonianum seeds have germinated, all at once, in the last 24 hours, after months of nothing! That means I've managed Rhody cuttings (vireya) and seed. My fingers are turning greener! Anyway. Morning fellow gardening freaks, hope you're well (especially Keith). I got home from work in the dark last night to find that one of the clay pots on the windowsill outside, containing tulips overplanted with winter violas had blown/fallen off and smashed, rather annoyingly. It did however give me the chance to have a nose at the tulips which are beginning to root (apart from the one that had rotted). I also found two rather large bags, actually, sacks, of grit ordered ages ago from the same hopeless shower that provided the cold frame. The delivery driver had called me at work to say he couldn't get into the courtyard where I live and none of the neighbours were in. I asked if he could redeliver it on Monday when I'll be off work but he said it could be several weeks before he was in the area again! By sheer good fortune a neighbour arrived home at this point and he was able to gain access but I'd advise you to avoid Creative Garden Solutions with a bargepole, my experience of them has been an unmitigated disaster! 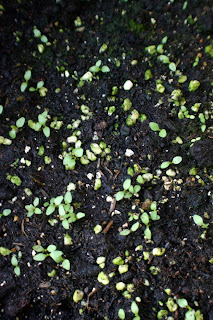 Better news now: the pipings from the old-fashioned Pinks I took a few weeks back have mostly rooted and the Lobelia cardinale cuttings taken at the same time and placed in a clear pot are starting to make roots (that's the beauty of a clear pot, you don't have to keep tugging at them, you can see what's going on as I find ccuttings root most successfully when places around the edge of the pot. Pricking out the candelabra Primulas was the right thing to do (phew!) and they are beginning to romp away, depite the chilly weather but then they are from a climate far colder than London's. The Verbascum phoenicum are also now beginning to look like the real thing (albeit in miniature). Still glad I left the Lilies alone as more are germinating by the day and the little baby bulbs are probably as safe in their pot as anywhere else. This only really leaves me with the dilemma of the Digitalis obscura which, apart from having some night visitor trample on them (squirrel probably) are making achingly slow progress and might benefit from pricking out, despite barely having true leaves but it worked for its sister ferruginea var. gigantea so, as I have dozens of seedlings, I might try the incredibly fiddly task of transplanting some of them into nodules. This will require the purchase of a new watering can (I've always fancied one of those nice metal ones) as both my plastic ones have blown into the school playground next door and the kids are on holiday. Oh, back to the grit: there are two kinds; little cotswold pea shingle for top dressing alpines and bulbs and anything the squirrel likes the look of; and a chunkier version for drainage in the bottom of pots and also lining the floor of the bulb frame so any water can run straight through, rather than leaving the pots sitting in a puddle. It will also help add weight to the bottom of my Lily containers as I was a bit worried that plants over a metre tall (with luck) would be prone to toppling in high winds. I've also got a packet of Tropaeolum majus "Whirlybird mixed" (semi-double nasturtiums to you and me) which I was thinking of planting around the bottom or there will be a lot of green before you get to the interesting bit at the top. I'm also aware that my planting is a bit spring-heavy this year after getting carried away with my Frits and Irises, so the nasturtiums will keep colour going up until the first frosts. 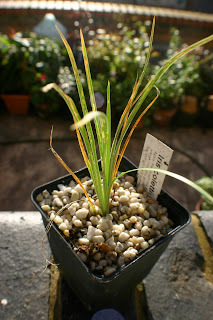 Oh, a couple of Meconopsis arrived midweek: napaulensis and superba, and Iris collettii. I know, I just can't help myself. Is there a 12-step programme for gardeners? Meconopsis napaulensis. The rosette will continue to grow until it is several feet wide and then, after a few years and when it feels like it, a stunning metre-high spike of (there is some argument at the moment about this as there are so many almost identical species) huge yellow poppy flowers will rise and amaze you. And then it will die. Iris collettii. The lovely blue/purple flowers only last a day but fortunately the plant is perennial. And lastly, my experiment with Antirrhinum "Peaches and Cream" under planted with Iris xiphium "Eye of the Tiger" might actually work. The seedlings are bulking up and have been thinned, while the Irises have slowed down a bit (at one point it looked like they'd be in bloom by Christmas) so, fingers crossed, as ever. If you want a real downer try this for size - because of this bug I never got my Brugamansia that I've raised from seed in before the frost (I just couldn't lift it). Looks well and truly knackered, but it's in the garage now anyway.